These days, it has become more and more difficult to find a new technology that feels magical. Think of the feeling you got the first time you tried dragging around in Google maps or the first time you paused live TV using a digital video recorder. I got that magical feeling when I used SnapTell—the first iPhone app that gave me that sense of discovering a valuable new capability. The idea for this app is simple. You have a camera and a Web connection. 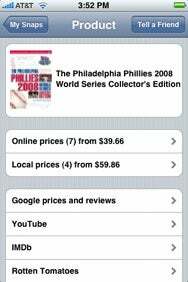 So use the iPhone's built-in camera to take a picture of any book, DVD or video game package; SnapTell will identify it. You don't need a barcode, and the picture can be a skewed and fuzzy—SnapTell will still return a positive ID. So here's where the magic comes in: SnapTell also produces a list of vendors that sell the product, including prices and links to the Web sites. It also includes links to several other sites that have related content such as IMDB, YouTube, and Wikipedia. The app also take's advantage of the location feature in the iPhone to look for nearby stores that sell the product. Better still, the local results include links to Google map directions to the store. So if you find a product in one store, but it is even cheaper a few blocks away, now you'll know. Because you are uploading a photo each time, SnapTell works best over Wi-Fi. But performance is perfectly acceptable over cellular networks, too. Because the app relies on the iPhone's camera, however, iPod touch users are out in the cold. SnapTell.com offers more information on the optical recognition and how the developer can make this great service available for free. But I prefer to not know the details. That just ruins the magic. SnapTell is compatible with any iPhone running the iPhone 2.1 software update.